A NAS is great for people with large media libraries: You can store all your Blu-ray/DVD movies in one place and stream them to computers, tablets or media centers throughout the house. If you're seeking a suitable NAS device for your BD/DVD collections, you are in the right place. Hundreds of NAS devices are available, and you can find models with one, two, four, eight, or even more drive bays. For most home users, a two-drive QNAP TS-253B NAS is just right. For some Qnap TS-253B new beginners, we have written this guide and tell you 3 solutions to backup your BD/DVD collections. Why choose the Qnap TS-253B NAS? The TS-253B uses the latest Intel CPU and 8GB of RAM to deliver good throughput and is equipped with a nice selection of I/O ports, including an internal PCIe slot that can be outfitted with an M.2 SSD/10GbE card. It also has a USB-C port, numerous USB 3.0 ports, an SD card slot, and HDMI connectivity with support for 4K video output. You can upload the multiple DVD and Blu-ray discs to it and stream movies to different devices for playback, create your home DVD and Blu-ray library easily, no any damage, no any space limitation. It will never let you down. To successfully backup DVD/Blu-ray to QNAP TS-253B, you will need to remove the copy protection from your Blu-ray/DVDs, and then you will get the permission to transfer and backup Blu-ray/DVD contents to QNAP TS-253B. Thankfully, there are many tools on the matket, wer have found some excellent DVD and Blu-ray copy software which attract most users' option, you can choose one and follow the steps to copy DVD and Blu-ray to QNAP TS-253B. Pavtube Video Converter Ultimate offers various copy modes to satisfy your different needs. You can make a 1:1 full disc copy of BD/DVD with original structure well preserved or a main movie copy without unwanted ads, comments, trailers. You also have the chance to rip Blu-ray/DVD to various popular digital file formats like AVI, WMV, MOV, FLV, MKV, H.264, H.265, MP3, AAC, etc or hot devices and program like smartphones, tablets, game consoles, TV boxes, TVs, etc preset profile formats for directly viewing with the optimal playback settings. Best of all, you can adjust the video parameters and edit the video with the built-in video editor. By the way, it keeps upgrade with perfect compatibility for the new Windows 10 and macOS High Sierra. 1. Open this DVD/Blu-ray Ripper and click "File" to import Blu-ray/DVD discs, Blu-ray/DVD Folder, BD/DVD ISO image file, DVD IFO File to this software. 2. Click Format button and choose the video formats you want: MP4, MOV, AVI , FLV, MKV, or you can choose the device preset: Apple TV 4K, iPhone 8, Samsung Galaxy Note 8, PS4, NLE software, etc. 3. 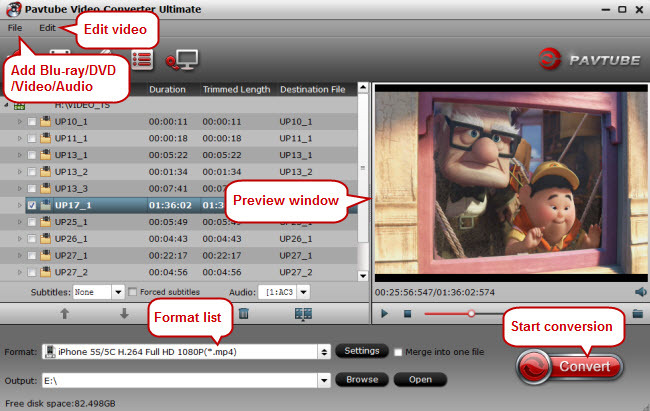 Click Browse and choose the output video save location, then click Convert button to strat the video conversion. Handbrake is without a doubt, one of the easiest video converter and BD/DVD ripper programs around. It's totally free, you can load the DVDs, Blu-rays, and other popular video files to it and get the MP4 and MKV video files. Handbrake support the various video and audio codec: H.265 (x265 and QuickSync), H.264(x264 and QuickSync), H.265 MPEG-4 and AAC / HE-AAC, MP3, Flac, etc. It also allows users to adjust video quality, audio track, Audio Sample Rate, bitrate, Picture Settings, etc. 1. Download and install Handbrake. Once installed open the HandBrake application. The application should default to a simple interface. 2. Click the Source button in the top left, to choose select the source BD/DVD files. 3. Click Browse next to the destination box to choose where you want to save the file. 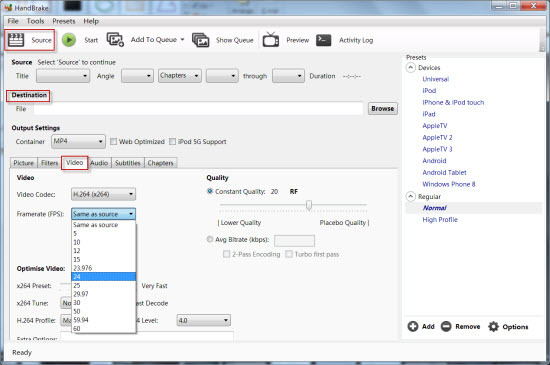 Then you can choose MP4/MKV video to output in "Output Settings". 4. Click Start to begin BD/DVD to MP4/MKV conversion. A progress bar will show its ripping speed; depends on many factors like machine speed filesize, etc. 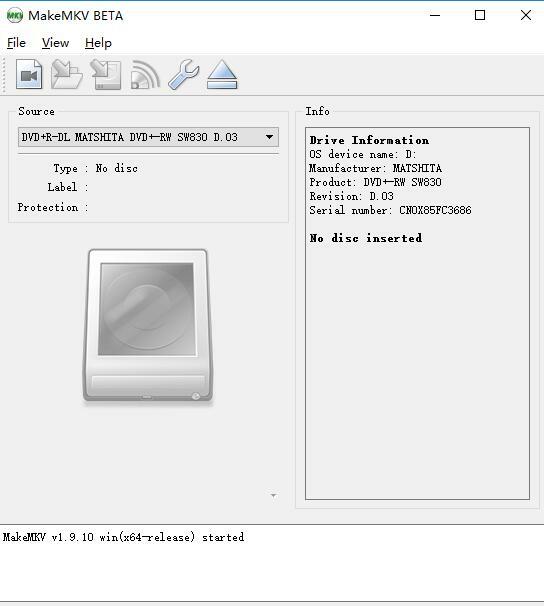 MakeMKV is a two-click decrypting, ripping and converting tool for DVDs and Blu-ray discs. All you need to do is pop in the disc, click the DVD or Blu-ray icon, and then hit MakeMKV – 30 minute later, you have got yourself a high-definition MKV file that can be played in most media players such as VLC or Kodi. DVD ripping will always be free, but Blu-Ray ripping is only free as long as it’s in beta, after which it will go to a to-be-determined price. 2. Click the big button that looks like an optical drive. MakeMKV will read the disc, then display its contents. 3. You can click the disclosure triangle next to the disc, choose to exclude different parts of a disc, such as the main feature and bonuses, or different episodes for a TV series, exclude any audio and subtitle tracks you don’t need. 4. Click the MakeMKV button, and wait for the app to create the file. After you choose one DVD and Blu-ray copy software, finish the disc video conversion, get the digital DVD or Blu-ray movies, you can upload to the QNAP TS-253B NAS for streaming on different devices. Best Way to Backup BD/DVD to QNAP TS-253B NAS, Which one? Above 3 ways are very popular, you can choose anyone to copy Blu-ray and DVD to QNAP TS-253B, on earth, which one is the best, especially for BD/DVD fans, a reliable BD/DVD Ripper can be your close BD/DVD friends. We have collected some information and made the table, hope to help you to choose you dream Blu-ray/DVD Ripper software.